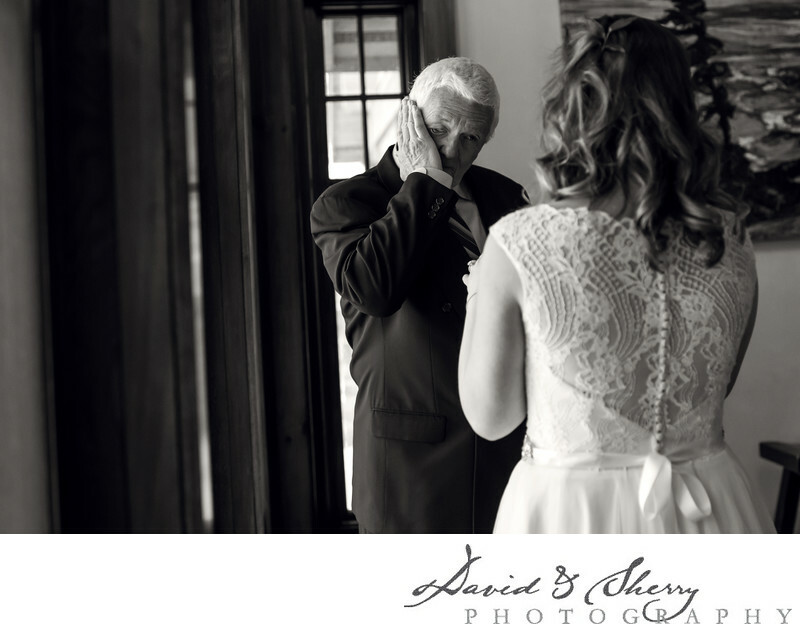 If there is anything that can make me emotional on a wedding day, it is capturing the moment when the father of the bride sees his daughter for the first time in her wedding dress. I have seen so many reactions during this moment throughout my career, and it still moves me every time. I will often instruct the bride to wait in a separate room, and then lead her Dad with his eyes closed into the same room. Once I am in the right location to shoot and the settings on my camera are set up, I tell the anxious father to open his eyes whenever he is ready. The reaction on every man’s face goes through a variety of emotions: shock, awe, excitement, just to name a few. But the most common reaction I’ve seen is pride, usually followed by a few tears and always followed by a passionate hug. These moments are what make my job worth doing, and capturing something so moving that will only happen one time is what wedding photographers are supposed to do. Every wedding is different. Every bride has a different personality, a different look, a different style and taste, but watching this scene play out on the big day before walking down the aisle is something that will always move me and make me love my job even more.